Was I interested in writing a show about the maiden voyage of the Titanic? The audience would be the ship’s passengers, the show would be performed as the evening’s entertainment – with top class food, music and dancing – and, at the end of the evening, the ship would sink, the audience would be rescued by the Carpathia and the evening would end with a celebration of the survivors’ arrival in New York. We arranged a meeting and discussed the whole idea. I was excited and totally captured by Andrew’s enthusiasm and imagination! A year or two earlier, he told me, two actors had performed a re-enactment of the voyage but only on a casual basis. Now Andrew wanted to enlarge the whole concept and run a show every Saturday. He envisaged sailors leaping around above the diners (who would be referred to as “the passengers”!). He wanted a girl swinging from the roof, singing! He wanted fireworks exploding above the domed glass ceiling! He already had sound effects of the collision with the iceberg and wanted to use them during the climax and before the rescue! I ended up writing a number of different shows – all set on and about the Titanic. The first couple were experimental and were altered from performance to performance. Eventually we got it almost right and “The Maiden Voyage of the Titanic” became “Titanic to New York” and ran for almost two years. Audiences flocked to the venue every Saturday night, Andrew became “Captain Andrew Singer” and a large cast and crew entertained approximately 100 people each performance. Then came alterations to the venue. Captain Andrew’s imagination ran riot! The hotel was transformed into a ship complete with decks, living quarters for Andrew and his family above the roof, and funnels atop the lot. Inside, the upper dining room became First Class and below, seen through a floor-well, were the Steerage passengers. At the psychological moment, an iceberg trundled past the First Class windows! The new venue required a new show. A request came from Andrew for MUSIC in the show. And so I learnt that I could write lyrics! 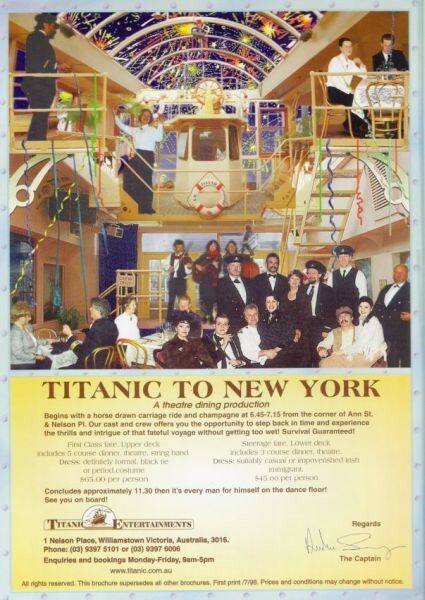 The first musical, still called “Titanic to New York”, included songs, an Irish dancer (it was the time of River Dance!) and played to two decks at the same time – First Class and Steerage. The shows ran every Saturday night and audiences enthusiastically joined in the make-believe. First Class passengers arrived in all the finery they could muster. They assembled a block away from the venue and were picked up by a horse-drawn carriage. They were served a First Class, five-course dinner, they drank champagne, danced on the dance-floor to the band and cheered when they were picked up by the rescue ship and arrived safely in New York. Steerage passengers, dressed more casually and often as Irish immigrants, traded insults and joined in friendly rivalry with their ‘betters’ above. More innovations from the Captain followed: more lights, extra effects, a ship’s photographer and more Titanic memorabilia. A make-believe lift ‘descended’ (very convincingly!) with the steerage passengers to the lower deck where, on the way to their tables, they passed glowing boilers and watery steel walls. At the sinking, water poured into under-floor channels and down the walls. Above, First Class passengers were provided with a full sized life-boat in which a select few would be able to escape the sinking ship. To take advantage of all these remarkable innovations, a new show, “Jessie of the Titanic” was written. This contained more songs; actors played the parts of stewards and stewardesses, and audience members were given names of actual passengers on that fateful, voyage. “Jessie of the Titanic” ran for two years. After seven exhausting years of writing and directing for Titanic Entertainments, I was ready to retire from theatre-restaurant! My husband, Geoff Senior, and I moved to the country and new writers took over. Since then, there have been different writers and different shows – all with the Titanic theme. Eventually, Captain Andrew Singer retired and a new Captain took over – but Titanic Entertainments continues in the tradition that was set way back in 1996. Audiences are still turning up every Saturday night to become ‘passengers’ on RMS Titanic and the venue continues to thrive. Have a look at Titanic Entertainment’s website — it’s a revelation!